For past few day i was planning to increase my postings at ApniTally. But while writing about Tally exhausts my mind out of ideas. So i was planning to include something more which can help Tally Users. So the first idea in this direction which came in my was to offer tips on computer usage and computer trouble shooting. So Here i am with some tips which i have found on internet related to computer operations, small Business and accounting. I am planning to give you tips which i come across while surfing on the net. 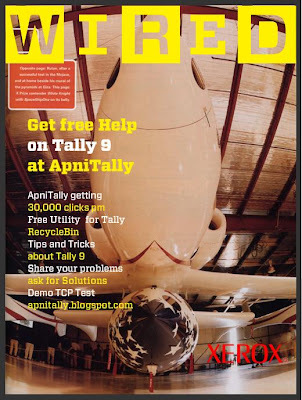 You may find these tips on one occasion or other while wondering on net but let me make ApniTally a place where a tally users can find answer to any issue related to Tally as well as general business operations. These tips will also available under Tally Tips tag. Faster XP Startup Tips : Try to startup your Windows XP faster with Configsys utility. Rediscover Desktop Icons : If your Desktop Icons have lost then is the tip to find them. Make your own Wired Cover : Here is a chance for you to be on cover of Wired Magazine. Design your own cover. See what i have designed Here is another example.